All aboard for Westeros and Winterfell! This tour covers the highlights of Belfast City, stunning scenery featured in the award-winning Games of Thrones and Giant's Causeway into two (2) exciting days. 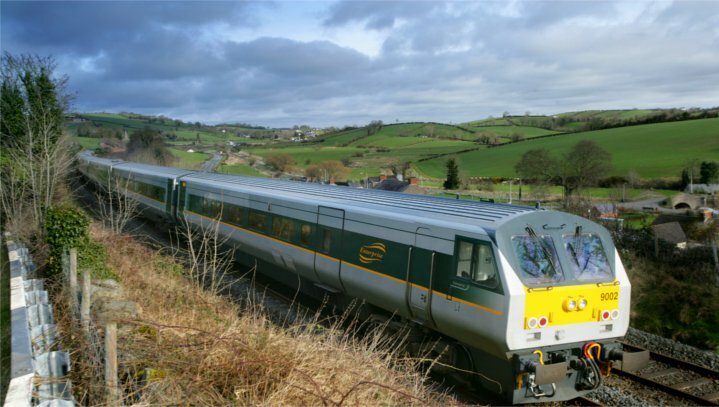 This tour is independently operated by Railtours Ireland and it is not sponsored, endorsed or affiliated with HBO or anyone associated with Game of Thrones. Check-in is 20 minutes prior to train departure time at the customer service desk at Connolly Station where our check-in representative will be in their yellow jacket! Check in for 7:35 am departure from Connolly Station (please check in 20 minutes prior to departure). We depart northwards through the Dublin suburbs, which soon give way to farmland. Soon we pass the exclusive coastal village of Malahide before we cross the wide Broadmeadow Estuary, followed by Rogerstown Estuary. Fine views of the sea appear as we pass through the coastal town of Skerries, followed by the fishing village of Balbriggan. A few kilometres further on we pass Gormanston, an Irish Air Corps military airfield –on the landward side. Red flags on the seaward side indicate military exercises are in progress. We travel through Drogheda. Immediately north of Drogheda we cross the historic river Boyne by a magnificent viaduct, with great views of the town. It was here that Oliver Cromwell put the entire population to the sword in 1649. At little further upstream is the site of the Battle of the Boyne, where (Protestant) King William of Orange defeated dethroned (Catholic) King James in 1690 – an event which is still celebrated annually by ‘Orangemen’ or ‘Northern Protestants’ on the ‘Twelfth’ of July. We now begin to climb into the foothills of the Camlough Mountains and border country. 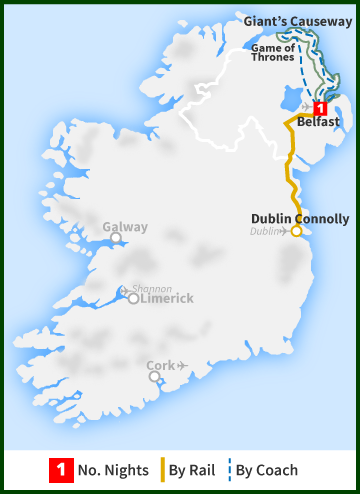 Arrive into Belfast, Ireland’s second largest city, you will be given hop-on hop-off sightseeing tickets to join the Belfast hop-on/hop-off tour which not only explores the city centre but also the Titanic Quarter (see the original dock where the great liner was built), and Belfast Castle. Our Hop-on Hop-off city tour provides your with a comprehensive look at our very special city. Your ticket is valid for 48 hours, to allow you to explore every area and district of this unique place. Rain, hail or shine, you'll stay comfortable on this tour- Belfast's only fully enclosed tour bus on wet days! Enjoy a Full Irish Breakfast at your leisure. At 9:00 am depart Belfast and travel north along the scenic Causeway Route on our Game of Thrones tour where we visit seven iconic sites from Series 1 to 4. At Cushendun we walk to the Caves where Melisandre of Asshai gave birth to her "shadow baby" who then slayed Renly Baratheon. Then on to Ballycastle to see where Varys was born as a slave in the Free Cities. Travel along the natural tree arches of Dark Hedges on Kings Road, one of Ireland's most photographed locations, where Arya Stark escaped from Kings Landing dressed as a boy. We break for lunch (not included) at the cosy Fullerton Arms in Ballintoy Harbour where several major scenes were filmed. You might even hear a story or two from the staff who have played host to some of the biggest stars in the show! 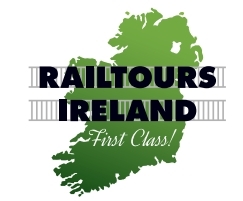 This tour is independently operated by Railtours and it is not sponsored, endorsed or affiliated with HBO or anyone associated with Game of Thrones. Return to Belfast for train back to Dublin. Returning to Dublin Connolly at 8:15 pm. This Tour Operates on Tuesday, Wednesday and Friday only. Please make sure the date selected is on one of these days.